At IBC, we have just announced Ultimatte 12, a new real-time hardware compositing processor that’s perfect for broadcast-quality keying, adding augmented-reality elements into shots, working with virtual sets, and more. Ultimatte 12 is available immediately from Blackmagic Design resellers worldwide and is priced at US$9,995. The all-new Ultimatte 12 is more than the world’s best keyer; it’s an advanced real-time compositing processor designed for the next generation of broadcast graphics. It features entirely new algorithms and color science, incredible edge handling, greater color separation, amazing color fidelity, and better spill suppression than ever before. The advanced 12G-SDI design gives you the flexibility to work in HD today and switch to Ultra HD when you’re ready. Sub-pixel processing gives you amazing image quality and textures in both HD and Ultra HD. Plus, it’s compatible with virtually all SD, HD, and Ultra HD equipment, so you can use it with the cameras you already have. We think Ultimatte 12 will enable a new generation of real-time cinematic-quality broadcast graphics for weather, sports, news, and entertainment. It’s also perfect for on-set pre-visualization in television and film production because it lets actors and directors see the virtual sets they’re interacting with while shooting against a green screen. Ultimatte 12 is designed to be more affordable so that it can be added to each camera to increase production quality. This is important because, when you’re working on live shoots with multiple cameras, each camera sees the green or blue screen differently. There will be variations due to lighting or the camera angle, which makes it harder to pull a perfect key. Ultimatte 12 eliminates this problem because it’s affordable enough to add to each camera. This ensures the highest-quality keys possible. With the power of a dedicated Ultimatte 12 keyer on each camera, live broadcast news, weather, sports, and virtual studios can look dramatically more photorealistic. Ultimatte 12 also has new features for augmented reality, which is becoming more and more popular in broadcast. For example, you often see on-air talent interacting with glass like computer-generated charts, graphs, displays, and other objects with colored translucency. Keying and compositing tinted translucent objects like this is virtually impossible with a traditional keyer. That’s because, when you subtract blue or green out of a semi-transparent tinted object, it changes the object’s original color, and the composite looks fake. Now, with Ultimatte 12, you get an exciting new “realistic” layer-compositing mode that can add tinted “glass-look” objects on top of the foreground image and key them correctly. This means that the augmented-reality object properly transmits the colors seen through it. Talent can even walk behind it, and the tinted colors are accurately preserved, making the shot look completely realistic. We have also recently announced that DaVinci Resolve 14, our professional editing, color-correction, and digital-audio software, is now available for download from the Blackmagic Design website. The beta program has been extremely exciting, and we have been very thankful for all the feedback as it let us make last minute changes to make it even better. New features include up to 10-times performance improvement, a whole new audio-postproduction suite with Fairlight audio built in, and multi-user collaboration tools that let multiple people edit, color, and mix audio from multiple systems, all in the same project at the same time. In addition, DaVinci Resolve 14 includes hundreds of new features for editors and colorists, including over 20 new effects, such as automatic facial recognition and tracking so customers can quickly refine and enhance faces in their shots. The collaboration tools include bin, timeline, and clip locking; secure peer-to-peer chat; a multi-user database; and a new timeline-comparison tool that lets you visually see the changes and merge them into your current sequence. Upgrading to DaVinci Resolve 14 is completely free for existing customers. 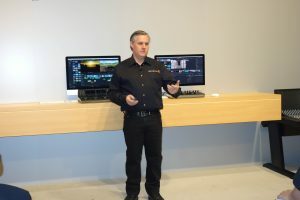 There are two versions: the free version, which is available for download from the Blackmagic Design website, and the paid DaVinci Resolve 14 Studio. The full DaVinci Resolve 14 Studio is now available for only $299, which is less than the cost of most annual cloud-based subscription plans. DaVinci Resolve 14 Studio includes the new collaboration tools; over 20 new Resolve FX, including advanced face refinement, 4K and 120-fps project support; stereoscopic 3D; optical-quality blur and mist effects; film grain; de-noise tools; and much more. DaVinci Resolve 14 Studio is now available with a software activation key, which allows customers to activate their DaVinci Resolve Studio license on a laptop and desktop computer at the same time. DaVinci Resolve Studio is also available with a hardware-based USB dongle for those customers who want to switch from one system to another instantly or, for security reasons, are unable to connect to the Internet to activate their license. With the release of Mac OS High Sierra, Apple’s Final Cut Pro 7 software will no longer be supported. Final Cut Pro 7 users who are looking for alternative edit software will find that switching to DaVinci Resolve 14 is very easy and only takes a few minutes. DaVinci Resolve 14 can import timelines from Final Cut Pro 7, shares many of the same keyboard shortcuts, uses a similar editing and trimming model, and gives users far greater audio and color tools. For customers looking to make the switch to DaVinci Resolve 14, we have made a video to help show how quick and simple it is to change from FCP 7 to DaVinci Resolve. Please check it out. We also introduced Fusion 9, a major update to our visual effects, compositing, 3D, and motion-graphics software at SIGGRAPH 2017. Fusion 9 is a massive new release that has been designed to support the latest workflows with new VR tools, entirely new keyer technology, planar tracking, camera tracking, and much more. For VR, Fusion 9 gives you a full 360-degree true 3D workspace, along with a new panoramic viewer and support for popular VR headsets, such as Oculus Rift and HTC Vive. VR in Fusion is completely interactive with GPU acceleration that lets you interact with elements in a VR scene in real time while wearing a VR headset. It also includes support for stereoscopic VR and a new 360-degree spherical camera that renders out complete VR scenes in a single pass. The new planar tracker in Fusion 9 calculates motion planes for accurately compositing elements onto moving objects in a scene. For example, the new planar tracker can be used to replace signs or other flat objects as they move through a scene. Planar-tracking data can also be used on rotoscope shapes. That means you don’t have to manually animate motion, perspective, position, scale, or rotation of rotoscoped elements as the image changes. Fusion 9 also features an entirely new camera tracker that analyzes the motion of a live-action camera in a scene and reconstructs the identical motion path in 3D space for use with cameras inside of Fusion. This lets you composite elements with precisely matched movement and perspective of the original. Fusion will auto-analyze the shot and calculate lens focal length and lens distortion. The new delta keyer brings state-of-the-art image science to Fusion’s keying tools. Delta keyer features a complete set of matte finesse controls for creating the cleanest possible keys while preserving fine image detail. There’s also a new clean-plate tool that can smooth out subtle color variations on blue and green screens in live-action footage, making them easier to key. Fusion 9 is a free upgrade for existing customers. The free version can be downloaded from the Blackmagic Design website. The paid Fusion 9 Studio has been reduced from $995 to only $299. Fusion 9 Studio adds optical flow tools, stereoscopic 3D, retiming and stabilization, third-party OpenFX plugin support, and unlimited distributed-network rendering. This means that large studios working on complex shots and high-end visual-effects–heavy feature films no longer have to pay a license fee for each render node. Customers simply purchase and install Fusion 9 Studio on all of their artist workstations and then install it on as many render nodes as they need, without any additional charges or ongoing maintenance costs. This new low price makes it easier for you to take advantage of the power of Fusion Studio for incredible keying, paint, compositing, tracking, motion graphics, titling and more.